With a variety of pricing plans to choose from, Cisco WebEx is one of the few examples of video conferencing software that doesn’t require you to download and install an application before you can use it. Simply open your browser and you’re free to join meetings with up to 1,000 participants, assuming your company can afford its lofty subscription rates. 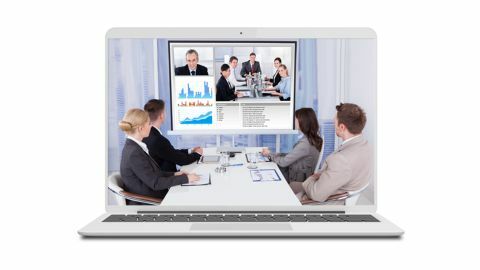 In an age where nothing has to be done in person and everything can be done online, the audience for video conferencing software has escalated from individuals on personal accounts calling their mothers while they’re studying abroad to major corporations who take advantage of the fact that most business operations can now be carried out remotely. But for businesses, choosing a video conferencing provider is a much bigger cause for commotion than, say, downloading Skype on the six-year-old laptop you borrowed from your aunt when you moved to Ireland for the summer. For that reason, we have to be especially careful when recommending products to company administrators looking to up their game in the video chat department. Known primarily for its networking hardware, Cisco isn’t the first name you think of when you invest in new conferencing infrastructure for your office workplace. Other names in the biz like RingCentral and GoToMeeting, for example, are so devoted to telecommunications that even their names reference that fact. That said, Cisco Webex is a compelling piece of video software for a number of reasons. For one, it offers a lot of storage for preserving your company-wide meetings, whether for the next month or the next decade, thanks to cloud technology. It also lets participants join conferences via their VoIP desk phones, and if you’re worried about employees or clients struggling to download the app, you can take solace in the fact that it’s a fully functioning web app, free of EXEs, MSIs and browser plug-in requirements. However, it goes without saying that no video conferencing software is without its faults, and Cisco WebEx’s are mostly in its pricing. While other video conferencing suites, such as Zoom and RingCentral Meetings are free to start, WebEx is another story. And not only that, but the plans from other services that are most comparable to WebEx are more affordable and, in some cases, have better features too. With that in mind, let’s take a look at Cisco WebEx and its four pricing tiers along with what each one brings to the table. For a Starter plan with WebEx, you can look forward to spending $13.50 (£10.52) every month if you pay once a year. By purchasing this plan, you’re telling Cisco that you have between one and nine people at your company looking to host meetings since you can only get up to nine licenses with WebEx Starter. Moreover, you can have up to 50 participants join each meeting and host unlimited meetings with no restriction on duration. Otherwise, with WebEx Starter, you get access to quite a few features. Screen and application sharing are joined by the aforementioned “join by VoIP” functionality and, of course, HD video. If you want your own permanent (and private) meeting room link that you can share with others, there’s a personal meeting room feature as well. As for archiving your meetings, you’re limited to 5GB of cloud recording and storage. Interestingly, you don’t really have to use WebEx to join a WebEx conference call either. According to Cisco, you can join on “any Cisco or standards-based SIP video device.” Yes, that includes Microsoft Skype for Business. Last but not least, administrators get their own portal with WebEx for account management and meeting settings, and you’ll get access to customer phone support – but only during business hours. Luckily, according to Cisco, the business hours for its corporate support team are 24/7. The next plan up from WebEx Starter is WebEx Plus, built for one to 50 hosts which bumps the limit up from 50 participants per meeting to 100 participants per meeting. Aside from that, all of the features from WebEx Starter carry over to WebEx Plus, so you don’t have to worry about missing out on anything when or if you decide to upgrade. Again, you get screen and app sharing, the ability to join in by VoIP, HD video, 5GB of cloud storage, a personal meeting room and an admin portal with customer support availability listed as “business hours only.” WebEx Plus costs $17.95 (£14.12) per month. Onwards and upwards, WebEx Business comes after WebEx Plus. For the whopping price tag of $26.95 (£21.21) a month, five to 100 people can host meetings with up to 200 participants. You still get all the features from WebEx Plus, including screen and app sharing, the ability to join from virtually any video system imaginable and administrative portal privileges. On top of that, though, you can leverage 10GB of cloud recording and storage. Cisco claims that the customer phone support ramps up to 24/7 even if, as we already suggested, the company’s business hours are 24/7 anyway. Finally, if you’re in need of a gargantuan video conferencing service that can house up to 1,000 participants at a time, then you’re probably the target demographic for Cisco’s Enterprise package. Despite the fact that you have to contact Cisco’s sales team to find out how much it’s going to cost you, WebEx Enterprise allotts your company unlimited cloud recording and storage. Additionally, you’ll be able to organize and conduct webinars, training and other specialized events with up to 40,000 participants depending on the nature of the circumstance. While its most basic Starter plan costs less than Zoom Pro, WebEx’s feature set is more in line with the free version. Across the board, WebEx has a lot of interesting things going for it – the main ones being its personal meeting room functionality and the ability to join WebEx calls from other services like Skype for Business. Be that as it may, its pricing is hard to justify having just reviewed Zoom. And although it is more affordable than GoToMeeting, that service from LogMeIn comes with a wide array of amenities, like drawing tools and intense security protocols, that simply don’t exist in the language of WebEx.